Your town is planning a new bear park... and you have been contracted to build it! Since animal welfare and species-appropriate housing is a matter dear to your heart, you're going to build large enclosures and spacious animal houses. However, it's not as easy as it sounds to fit everything within the space you've been given, so skilful puzzling is key to getting the most valuable animals in your park and constructing impressive (and valuable) Bear Statues. 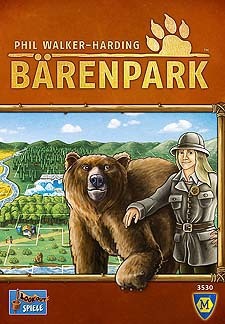 At the end, will your park be the best... or just bearable? Excellent light puzzly tile-placing game. Players are trying to build the best bear park by selecting polygonal tiles to place on their zoo boards. Similar to Patchwork if you have played that, but plays up to 4 players. A players turn consists of placing a tile on their board and then taking a tile which corresponds to the icon-type they have covered up with the previous tile. Players are trying to race to take the higher point value tiles, and complete their zoo segments in order to take the higher value bear statues from the supply. There are also optional goals/awards which can give players something else to aim at as well, and I recommend playing with this straight from the off. Play will end when a player completes all 4 boards, and points are then tallied up. Components are good quality thick tiles, and artwork is by Klemens Franz so is top notch. The game plays well at all player counts, and turns are quick with only the more AP-prone taking a few minutes to puzzle out where best to place tiles. Gameplay is really good, players are asked to make decisions regarding tile selection and which goals to aim for. There are multiple paths to victory - should you aim to complete tiles and get the statues, or go after the public objectives? Perhaps you want to grab the highest value enclosures? If you like Tetris style puzzle games, then you should love this game. Games take anything form 30-45 minutes, and you will almost certainly want to play another round! My only criticism is that the game takes almost as long to setup as it does to play, with sorting and stacking the pieces in descending points order etc.